As we entered the new year in our new marriage my wife and I have decided that we were going to try to find a new bed for our master bedroom. Unfortunately, after large amounts of searching, we could not find anything that fit the bill for us. Fortunately, we both are very crafty open to each other's design styles so we decided to set forth and build our new bed design. We started our design journey by making a list of what we like and dislike about our current bed. Below is what we landed on. After putting the list together we determined the best route to move forward to get each of our needs. Build the new bed with a very low to the ground or flush with the ground. Make sure there is a solid connection point throughout the new bed. Create an upholstered headboard that fits with the style of the bed – possibly add wood trim around it. Knowing all of our goals after creating these lists we went forth and spent a few hours on the computer going over different design options. After about 2 hours of work, we ended up with a rough conceptual plan that you will find below. 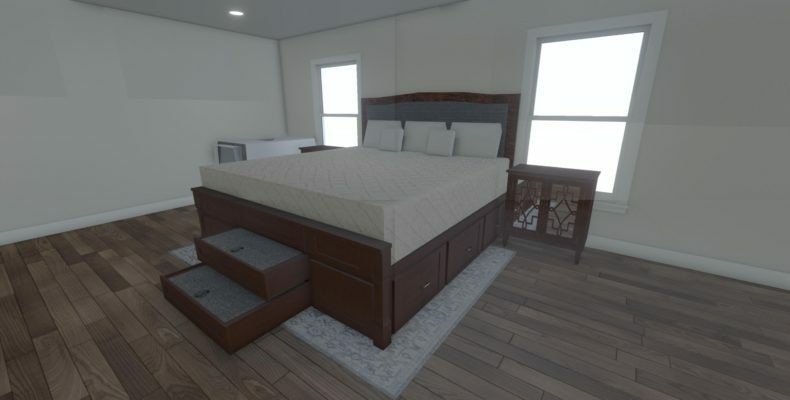 Our next step is to create a build set of the bed and do whatever we can to make it as light as possible and hopefully not built-in.